As Lazy Man points out, not only was the review positive but he linked to places where the product could be purchased. Normally, this sort of clumsy trademark C&D is deployed by unhappy companies seeking to bury criticism. He contrasts Nutribullet's reaction to other companies whose products have received good reviews from his site. When I wrote a similar article about SodaStream, including the trademark in the keywords, the employees of the company printed it out and shared it through the office. When I wrote about True Orange the company emailed me to thank me and asked if they could me send me free product. These companies get it. When you get good, free promotion, enjoy it and, if you want to be polite, thank the person for the help. 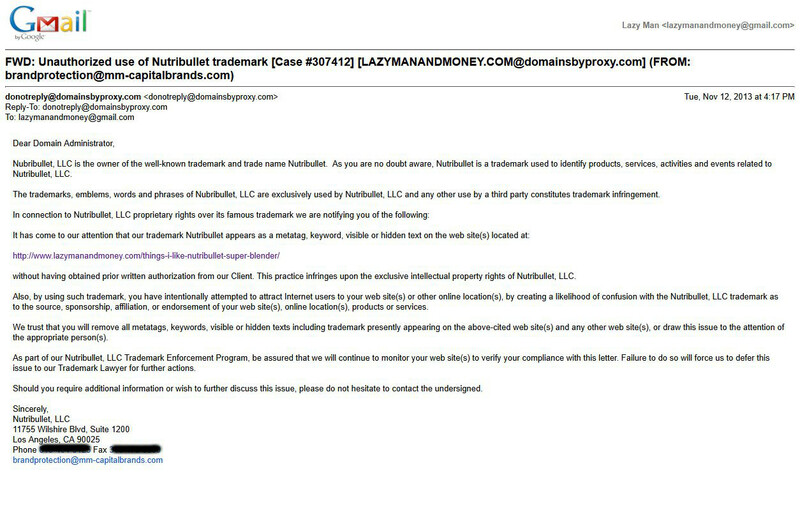 Beyond the nonsense about "metatags" and "keywords" (more on that in a bit), there's the ridiculous assertions and stipulations made and requested by Nutribullet's "Trademark Enforcement" team. First, the claim that Lazy Man "intentionally" used Nutribullet's trademark to attract users to his site (everything posted at nearly any website is designed to "attract users") is standard IP bully myopia. To tiny minds like these, the entire internet is out to profit on its hard work and, therefore, bloggers like Lazy Man must be stopped before they bankrupt Nutribullet by using its name in a review of its product. Neither of those claims stand up to any scrutiny at all. Skipping past these ridiculous claims, one stumbles across the absurd demands of Nutribullet. Returning to the "metatag" issue -- it's as least as moronic as any other "issue" raised by Nutribullet, as Lazy Man (who's had previous experience with bogus "metatag" claims) explains. There is no chance that someone would be mislead into thinking my site is the official NutriBullet website. That covers the "source" part of their complaint. As for "sponsorship, affiliation, or endorsement" I don't see using a meta-keyword would convey that impression to users. I have yet to come across the Internet user who looks at meta keywords to determine if there is an affiliation. If such an Internet user did exist I could see how they'd be confused, because that simply isn't what meta keywords are for. Not so fast, Nutribullet would likely exclaim. What about search engines? Now there is a (poor) case to be made about search engines using meta keywords, which could also attract users to my site. However, years ago, Google declared, "Google does not use the keywords meta tag in web ranking." Still not satisfied. How about getting some actual law involved? Also there's legal precedent: "the judge ruled that since the keyword META tags do not influence search results, having trademarked terms in them are immaterial." So we can throw that out as a reasonable explanation for the letter... unless NutriBullet is unaware of the case law. It seems very likely Nutribullet is unaware of this precedent, as well as generally being unaware of the proper response to complimentary reviews. Granted, this isn't Nutribullet itself speaking, but it is its legal representation. Not keeping a close eye on those supposedly watching out for your best interests often results in exactly this sort of PR fiasco. The legal team, by the way, is none other than MarkMonitor. [Screenshot of email shows originating address is "brandprotection@mm-capitalbrands" -- the registrar of that domain being MarkMonitor.] Nutribullet's hired gun is apparently unable to distinguish between helping and hurting its employer, much as it has been unable to distinguish between infringing URLs and HBO's official content when sending DMCA notices. As the news of this letter spreads around, it won't be MarkMonitor who ends up looking bad. Nutribullet itself will be the company losing out -- the one remembered as the entity that greets good reviews with legal threats. Nutribullet may think it's receiving IP protection, but all it really seems to have acquired is a sloppy contractor who can damage Nutribullet's reputation more effectively than it can protect its IP.